The United States has again put both Venezuela and Russia on notice, after days ago two military planes carrying a contingency of about 100 Russian troops led by a high ranking officer touched down in Caracas. National Security Adviser John Bolton warned that foreign military "meddling" in Latin America would not be tolerated, while Secretary of State Mike Pompeo called on Russia to "cease its unconstructive behavior". “The United States will not tolerate hostile foreign military powers meddling with the Western Hemisphere’s shared goals of democracy, security, and the rule of law. The Venezuelan military must stand with the people of Venezuela,” the national security adviser wrote on Monday. Venezuela quickly lashed back, accusing the US of causing the impoverished nation's third mass electricity outage in less than a month on Monday. Caracas, Venezuela during the prior March 9th outage, via Getty images. 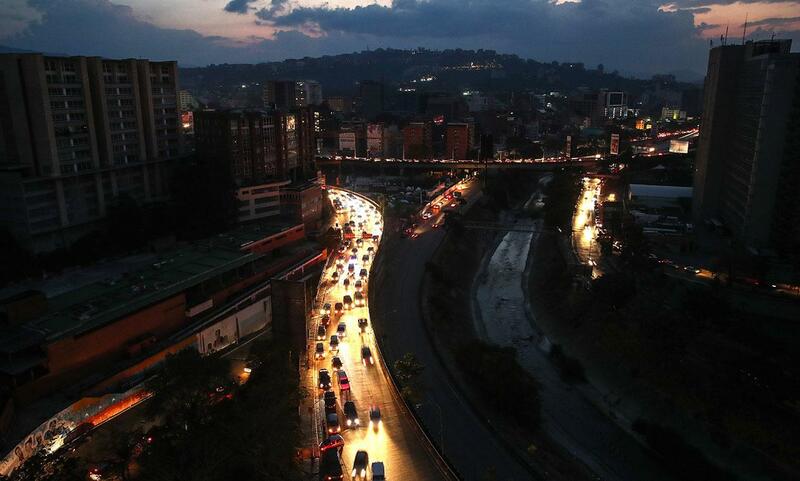 Monday's outage affected a little over half the nation, including parts of Caracas. Shortly after most of the country's electricity was restored, Venezuelan Vice President Delcy Rodriguez made a televised statement saying the “fascist right” and their American “imperial masters” had attacked key transmission lines, impacting about 57% of Venezuela. In response to the earlier outages, Venezuela's Defense Ministry vowed to deploy armed forces to protect the national electricity system. President Nicolás Maduro had previously blamed Washington for the earlier outages, claiming over Twitter that the Trump administration was engaged in an "electrical war" which was "announced and directed by American imperialism against our people." Rodriguez further told state television this week that the opposition was responsible for the mass outage, claiming it "wants to plunge the population into profound unease". Meanwhile US-backed opposition leader Juan Guaido shot back on Twitter, saying that Maduro "uses these moments to disinform and create anxiety". Likely as Washington continues to eye Caracas for regime change and destabilizing coup efforts, Russia could be drawn into further on the ground military cooperation, setting the stage for the next potential US-Russia proxy war, similar to the past few years of war in Syria.